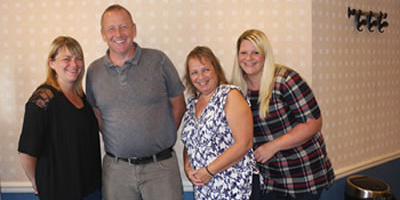 ‘MFH’ is delighted to welcome Jo, Hayley, Becky and Paul into the ‘Music for Health’ family. We know that their passion, enthusiasm, and in Jo’s case, experience, will greatly enhance the ‘Music for Health’ team. “Having spent many years working in the social care sector and with people with all sorts of health problems, I was attracted to music for health and the benefits I can see residents gaining from attending the workshops. The varied programme of exercises to music, singing and playing percussion instruments is both mentally and physically stimulating and you can watch as the residents start to have fun. The workshops in Maidstone & Gravesend are run by myself and my family with my two daughters Becky and Hayley leading on many of the sessions. Please contact Jo, Hayley or Becky to book a free (no obligation) Workshop on 01634 231041.